Two-goal Jordan Macleod (blue) in action for Peterborough Sports against Biggleswade. Photo: David Lowndes. Peterborough Sports will travel to either Cockfosters or Wembley in the third round of the FA Vase. It’s the furthest Sports have ever travelled in the competition, but they are among the favourites to lift the famous old trophy. Mark Jones (blue) in action for Peterborough Sports against Biggleswade. Photo: David Lowndes. 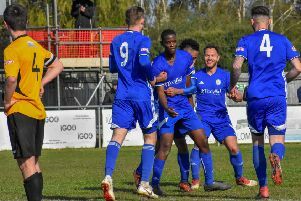 Sports beat Biggleswade FC 5-3 in the second round at PSL on Saturday which is an indicator of how tough the third round tie will be. Biggleswade play in Division One of the South Midlands League, while Cockfosters and Wembley are fourth and fifth respectively in the Premier Division of the same competition. Cockfosters and Wembley play their second round tie tomorrow (November 15). The third round is scheduled for Saturday, December 3. The final of the FA Vase is staged at Wembley Stadium.